Are Avocados Good for Your Skin? If you want beautiful-looking skin without buying expensive skin products, make avocados a part of your diet. Avocados are creamy, tasty, inexpensive and versatile. You can make guacamole, top sandwiches or salads with them or add avocado to quesadillas and tacos. If you get tired of eating them, you can apply avocados directly to your skin for a glow. Avocados contain poly- and monounsaturated fatty acids, which protect your skin. Monounsaturated fats keep the top layer of your skin moist so it's soft and healthy looking. Polyunsaturated fatty acids guard skin from sun damage and protect against symptoms of skin sensitivity and inflammation, according to the Linus Pauling Institute at Oregon State University. When you metabolize food or are exposed to pollutants, your body makes free radicals. Free radicals harm cells, including skin cells. Antioxidants found in avocados, such as carotenoids, vitamin E and vitamin C, help protect against the damage of free radicals. One particular carotenoid, lutein, promotes the water content and elasticity of skin and decreases the destruction of beneficial skin lipids. Vitamin E protects you from ultraviolet light. Your body needs vitamin C to make collagen, which is the main structural component of skin and the source of its elasticity and firmness. Avocados contain between 2 and 6 micrograms of biotin or between 6 and 16 percent of the Dietary Reference Intake. Biotin is part of the B complex vitamins. All the B vitamins are necessary for healthy skin, according to the Linus Pauling Institute. Without enough biotin, you may develop dry skin and a scaly, red rash. Use avocados for an at-home day at the spa. Mash avocado and spread it across your body. Leave it on for 10 to 15 minutes and then take a lukewarm bath or shower. The oils will penetrate and soften your skin. Put mashed avocado on your face to wipe away signs of aging, or mix avocado with raw honey and yogurt to get rid of dead skin cells for a radiant and youthful glow. 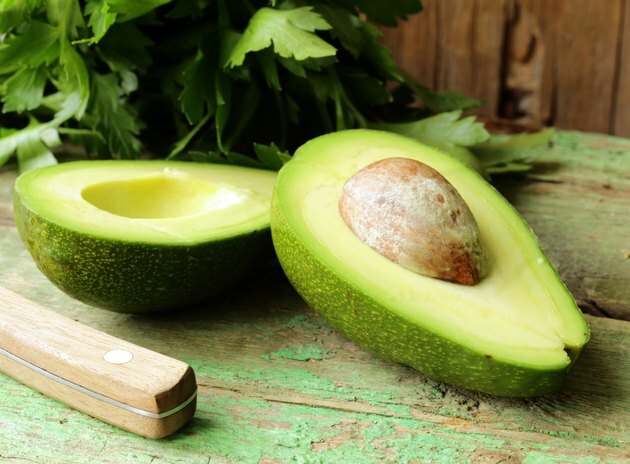 If you stayed out in the sun too long, apply avocado directly to sunburned skin to ease pain.